Mike Fraser, a member of the high IQ group Mensa, is renting a central Dublin flat and doing pressured computer work. In autumn his Garda detective friend Ricky Norton disappears undercover. 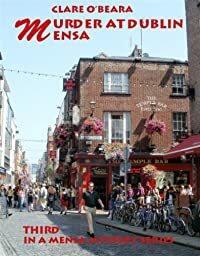 First he asks Mike’s girlfriend Cara Cassidy to investigate the apparently accidental death of an elderly music teacher, Audrey Gregory, in the expensive embassy belt of Dublin Four. Cara, a tree surgeon, makes enquiries as she lops trees on Ailesbury Road, staffs the Young Scientists Exhibition and chairs Irish Mensa. Ricky reappears at Cara’s New Year’s Eve party, having posed as a homeless man to arrest heroin dealers. Soon afterwards the girl follows the dead woman’s cat into its former home – with explosive consequences. By the Amazon No. 1 Bestselling author of MURDER AGAINST THE CLOCK and MURDER AT IRISH MENSA.